Our funding programme starts at an early age. Find out about ways how we can support you. 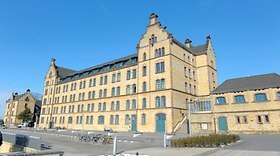 The CLAAS Foundation maintains a network of renowned universities in Germany and abroad. Read about our current activities. The CLAAS Foundation aims to support education, research and development in the field of agricultural engineering. Are you a team of students? Do you wish to construct your own autonomous robot and participate in the international Field Robot Event? You need financial support to get the basic equipment for your robot? The CLAAS Foundation can help you – up to a maximum amount of 1500 Euro per team. List and cost of equipment you wish to use and how much funding you require from the CLAAS Foundation. The team selection will completed by the end of April 2019. The Field Robot Event 2019 takes place 17th – 21st June 2019 in Heilbronn, Germany, collocated with the German Flower Show. The CLAAS Foundation honoured emerging talents in the field of agricultural sciences for their degree theses on agricultural engineering. Four Helmut Claas scholarships and other prizes worth over €45,000 were awarded to students from eleven countries. “The selection of scholarship holders and award winners takes place on the basis of the topics and the scientific quality of the submitted bachelor Thesis. The curriculum vitae, personal interests and social commitment also play a role for the independent jury”, says Frank Klüsener from the Executive Board of the CLAAS Foundation. 1st Prize: Patrick Lehr, University of Hohenheim. His bachelor thesis investigated the relationship between the cut and other processing techniques for vines, as well as biochemical changes in the plants. 2nd Prize: Levente Széles, Budapest University of Technology and Economics. His bachelor thesis explored methods of cultivating the Chinese water chestnut in Hungary and the development of a harvester prototype. 3rd Prize: Johannes Friedrich, Technical University of Munich. His bachelor thesis researched the possibilities of using radar and laser technology to control mobile feeding units in dairy cattle stables. 4th Prize: Malte von Bloh, also from the Technical University of Munich. His bachelor thesis examined a variety of camera and sensor measurement equipment, among others to determine the nitrogen content in the early development stages of cereal crops. Besides the one-year scholarships, four bonus prizes worth €1,500 each and several International students prizes worth a total of 31,500 euros were awarded. In addition, two students from the Hochschule Weihenstephan-Triesdorf each received a scholarship for the course "international MBA Agricultural management". Two students from Weihenstephan-Triesdorf University of Applied Sciences were the first recipients of a scholarship, with which they hope to earn an international MBA in agricultural management. The CLAAS Foundation has organised the first ever competition of its own for schoolchildren – challenging the technical skills of the next generation of inventors with the aid of mini-tractors. A total of eight teams from seven schools in Lower Saxony took part in the competition, each of which consisted of between two and four students from the seventh and eighth classes. In the run-up to the competition, every school received class sets containing 20 metal tractor kits, which were assembled during lessons. ‘Our aim is for technology, natural sciences, mathematics and computer science to become firmly established at the schools from an early stage. Some secondary schools in Lower Saxony have already introduced technology as a teaching subject from Class 5. Technology should be fun, and you have the most fun when you’re with others,’ explains Sylvia Looks of the CLAAS Foundation governing board. In the competition, the students and their electrically driven tractors had to compete in three events. In the slalom course it was speed that counted; on the obstacle course it was a matter of agility, and in the assembly competition of technical dexterity. In this last event, each team had a fixed time to assemble a prescribed set of components with the tools provided, and the quality of their work was evaluated. Finally, the students created a poster with information about their team and their work on the tractor model – which also formed part of the overall assessment. A jury of three announced the proud winning teams. First place went Class I of Langen Secondary School. Second place went to the School at Auetal/Ahlerstedt, represented by the First Ahlerstedt Trekking Club, and the ‘Burning Meteor’ team from Emsland Comprehensive School came in third. As their prize, the winning teams each received admission tickets for a natural science museum, as well as a small contribution to class funds. The competition took place at CLAAS Weser Ems GmbH in Neerstedt, who in addition to the use of their premises also provided a supporting programme. Besides other activities, this meant that students could ride on real agricultural machines, and so experience life-sized farming technology as well. New teams for the Field Robot Event may apply by Friday 27th April 2018. The team selection will completed by the end of April 2018. The Field Robot Event 2018 takes place 12th – 14th June 2018 in Bernburg-Strenzfeld, Germany, collocated with the DLG-Feldtage. 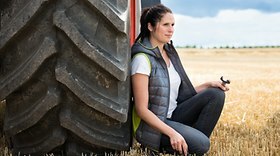 The latest scholarships to be awarded by the CLAAS Foundation to emerging talents in the field of agricultural sciences for their degree theses on agricultural engineering have been presented. The Helmut Claas scholarships and other international student prizes with a total value of over 45,000 euros were given to students from Bulgaria, Germany, Great Britain, the Netherlands, Hungary, Slovakia, Russia, Poland and Romania. During the prize-giving ceremony, the students gave talks on their theses and presented the details of their research areas. The suspense lasted right until the end, because it was only then that the scholarship candidates found out which prize they had received. The task of awarding the eagerly awaited certificates was taken on by Helmut Claas, Chairman of the Board of Trustees of the CLAAS Foundation. The CLAAS Foundation supports young talents: The prize-winners, the Board of Trustees and the jury met for a group photo after the awards ceremony. Helmut Claas Scholarships support students in the general engineering disciplines and those completing business management degrees. 1st prize: The first prize of a scholarship worth 7,200 euros went to Dagmar Wicklow, student of organic agricultural sciences at the University of Kassel, Witzenhausen. Her bachelor's dissertation involved a business assessment and system-theory analysis of mother-bonded calf raising in organic dairy cattle farming. 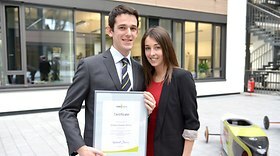 2nd prize: Hubertus Kleuter, an agricultural sciences student with a focus on engineering at the Osnabrück University of Applied Sciences, won the second prize of 6,000 euros. His master's thesis was a benefit analysis of NIR sensors for use in commercial liquid fertilisers. 3rd prize: Tobias Rapp from the University of Hohenheim was awarded the third prize of 4,800 euros. His master's thesis dealt with the measurement of flow velocity and creation of a flow profile in a biogas fermenter for a newly developed bionic agitator, analysed independently of viscosity. 4th prize: The fourth prize of 3,600 euros went to Simon Wolfram from the University of Kassel,Witzenhausen. He investigated the relevance and future possibilities of insects as a foodstuff and fodder in Europe, with a focus on Germany. Four bonus prizes, each worth 1,500 euros, were awarded in addition to the annual scholarships to students from the Technical University Aachen (Germany), Harper Adams University (Great Britain), HfWU Nuertingen-Geislingen University (Germany) and the Budapest University of Technology and Economics (Hungary). The International Student Prizes, each valued at 4,500 euros in total, were awarded to students from the Banat University of Agricultural Sciences and Veterinary Medicine in Timisoara (Romania), the Budapest University of Technology and Economics (Hungary), Wageningen University (the Netherlands), the University of Agriculture in Nitra (Slovakia), the Angel Kanchev University of Ruse (Bulgaria), the Kuban State Agrarian University (Russia) and Poznan University (Poland). Hermann Lohbeck, Speaker for the CLAAS Group Executive Board since 1st October 2017, is a new member of the Board of Trustees. He takes the place of Dr. Meuther, who is retiring after twelve years of committed service. Dr. Kim Blackburn of Cranfield University (UK) and Prof. Thomas Herlitzius of the TU Dresden are new members of the jury. Helmut Claas hands over the first prize to Dagmar Wicklow. The Field Robot Event 2017 takes place at Harper Adams University, Newport from 14th – 16th June 2017. The CLAAS Foundation in Harsewinkel has awarded scholarships and other prizes to bright young stars in the fields of agricultural sciences, engineering and business management. Prizes at a total value of more than 45,000 euros went to students from Bulgaria, Germany, England, the Netherlands, Hungary, Slovakia and Romania. The winners and teachers at the partner universities came together on the eve of the ceremony to socialise and to meet young scientists from other countries. 'These informal get-togethers are hugely important for us as a charitable foundation, as they help us to continue expanding our international network of universities and cooperation partners,' says Sylvia Looks from the Executive Board of the CLAAS Foundation. The nominees held talks on the bachelor theses they submitted, but did not find out which prize they had actually won until they took possession of the certificate. Helmut Claas, Chairman of the Board of Trustees at the CLAAS Foundations, personally handed over the certificates and congratulated the winners. 1st Prize: The first prize, a scholarship worth 7,200 euros, went to Philip Schierning, student of organic agricultural sciences at the University of Kassel, Witzenhausen. His bachelor thesis investigated how various wheat mixtures can be used to optimise baking quality. 2nd Prize: Andreas Kopf, student of mechanical engineering at the KIT (Karlsruhe Institute of Technology), was delighted to come in second and to collect the prize money of 6,000 euros. His bachelor thesis looked into the issue of optimising combustion engines. 3rd Prize: Maximilian Springer from the Technical University of Munich was awarded the third place worth 4,800 euros. In his bachelor thesis, he explored the efficient use of mobile agricultural robots in sowing processes. 4th Prize: The fourth prize of 3,600 euros went to Thomas Sutton from the Harper Adams University. His thesis discussed the ideal combination of tractors and attachments. Philip Schierning accepts his first prize from Helmut Claas. Three Bonus Prizes, each worth 1,500 euros, were awarded in addition to the annual scholarships. Sophie Lippmann from the University of Kassel was the prize-winner in the Internationality category. The paper she submitted focused on improvements in food safety in rural, small-town and urban settings in Africa. James Charnley from the Harper Adams University received an award in the Technical Involvement category for his paper on the importance of brand equity in industrial decisions to purchase agricultural tractors in the United Kingdom. The bonus prize in the Market Mechanisms category went to Jan Fischer from the University of Vechta. In his bachelor thesis, he used the coffee industry as a benchmark to analyse and assess global purchasing strategies for raw materials in the agricultural sector. The International Student Prizes, each valued at 4,500 euros, were awarded to students at the Banat University of Agricultural Sciences and Veterinary Medicine in Timisoara (Romania), the Budapest University of Technology and Economics (Hungary), Wageningen University (the Netherlands), the Slovak University of Agriculture in Nitra (Slovakia) and the 'Angel Kanchev' University of Ruse (Bulgaria). You can download the text here.